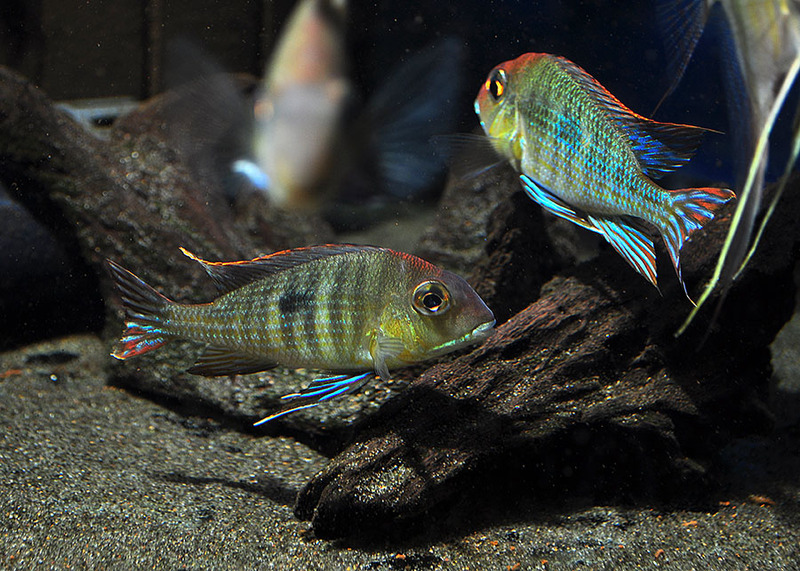 ﻿ Friday Photospread - Spawning Geophagus sp. "Orange Head Tapajos"
Geophagus sp. “Orange Head Tapajos”, aka. “Red Head Tapajos” Male, center foreground, female back left. 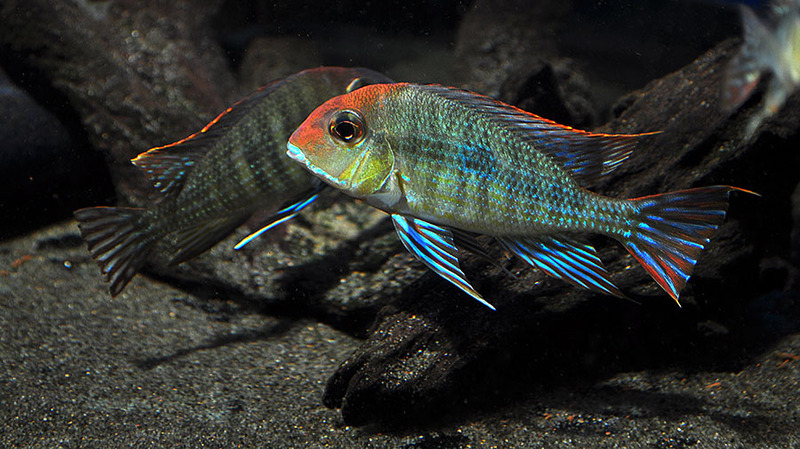 I’ve always loved the look of the Geophagus eartheaters; G. surinamensis was a staple “show” fish community addition when I worked in a retail setting, and G. altifrons long stuck in my head as a “dream “show fish. The large size but normally passive nature of the Geophagus spp. remains one of their more endearing traits; they look fantastic as feature fish in a calm setting with other compatible fish. 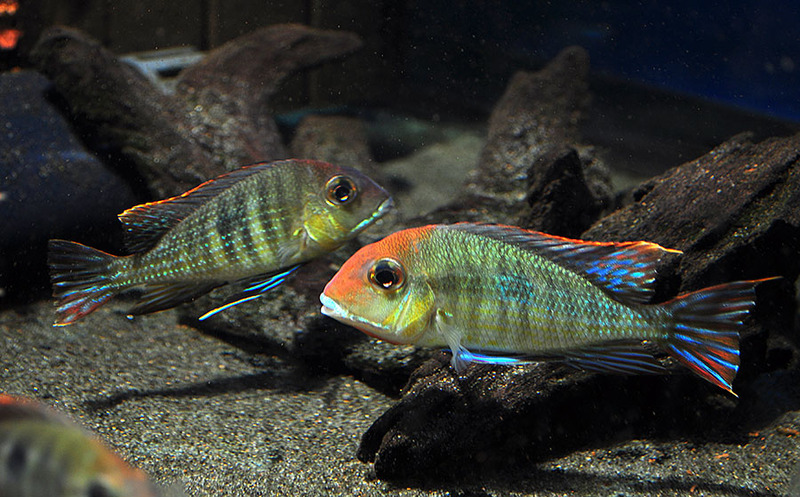 I never had a customer come back to complain about the Geophagus I had sold to them. These are fish people like! 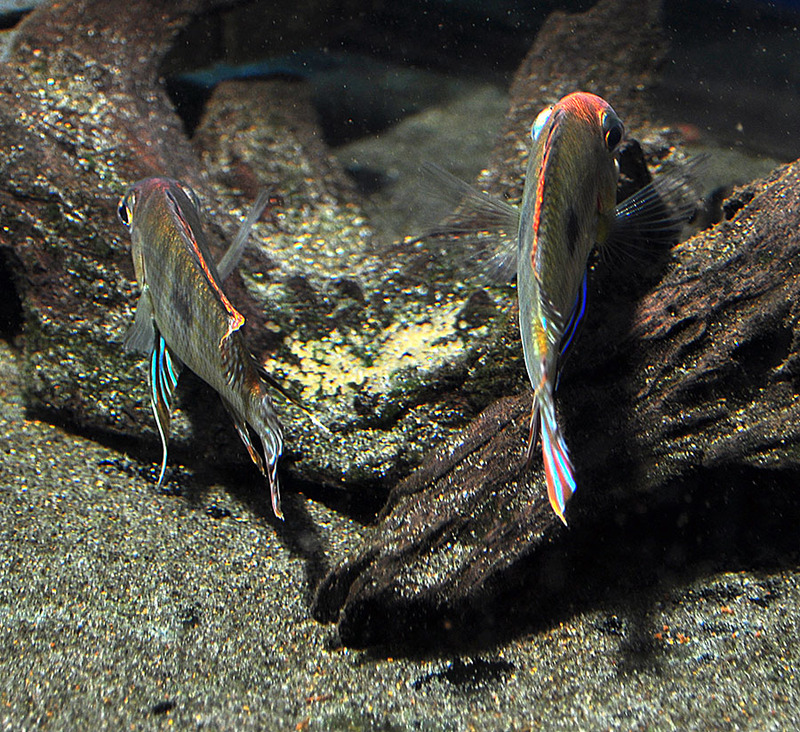 Male (foreground) and female (behind) are up to something; the rest of their group has no problems rushing the front of the tank to beg for food. Ever since I picked up Angelfish (Pterophyllum sp.) as a breeding focus in 2012, I’ve been in search of ways to “double down” on broodstock tanks. In marine fish breeding, it’s easy enough to double the potential output simply by housing disparate pairs of fish in the same tank, for example a pair of clownfish (Amphiprion sp. or Premnas sp.) sharing quarters with a pair of dottybacks (such as Pseudochromis sp.). While I’ve considered many candidates including Corydoras catfish, Bristlenose Plecos, livebearers and even killifish species, cichlids remained a group worth looking into. Besides trying out Kribensis and their relatives (Pelvicachromis sp.) I picked up a large group of Geophagus sp. “Orange Head Tapajos” last year as F2 juveniles that were around 1″ in size. This was a species that wasn’t readily available in the mainstream hobby back in the 1990’s, but I think we’re really fortunate to have it more available now. I should mention that this is a fish with no shortage of name permutations; Tapajos, Red Head Tapajos, Red Cap, Orange Cap, Peach Head (seen at a local shop once), all are names applied, and all are likely the same fish. I should also point out that there is potentially more than one subtle geographic variant of this still undescribed species. 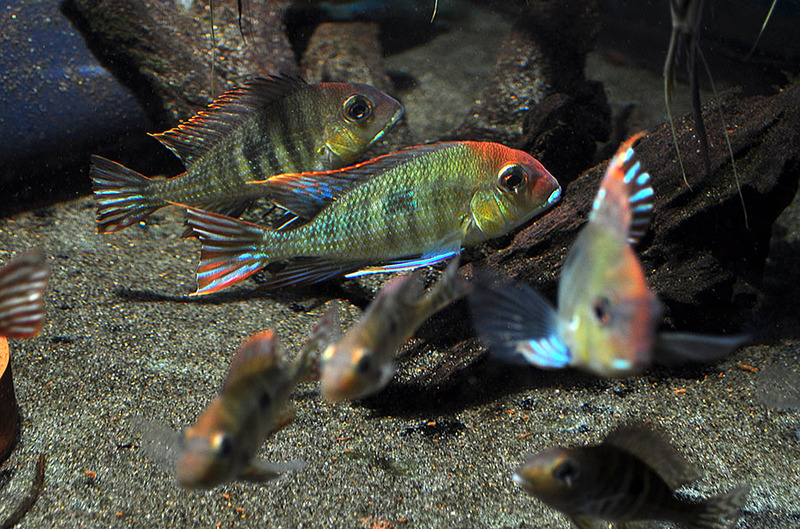 While references conflict, the consensus seems to be that the Tapajos is potentially one of the smallest Geophagus in the hobby (max sizes are often put at 5-6 inches). This is obviously a benefit to anyone with limited space, as well as anyone who simply doesn’t want to deal with 10-inch fish! The fish shown in these photos today are just around 3.5 to 4″ at this point; that’s still technically “dwarf” category in some cichlid circles (although these fish shown here will certainly continue to grow…they’re only a year old). Most of the Tapajos I obtained were sold off to area aquarium shops, but I held a few back, initially 20 or so, to grow out. They moved from tank to tank, first being grown out with Angelfish babies and ultimately coming to share the tank with my wild Atabapo Altum Angelfish (Pterophyllum altum). Arguably the Spotted Demonfish (Satanoperca daemon) would be a more biotopically accurate eartheater to house with Altums, but I’m not that fussy! One of the most interesting things I noticed about housing the Geophagus with the Altums was that the Altums became much more outgoing. 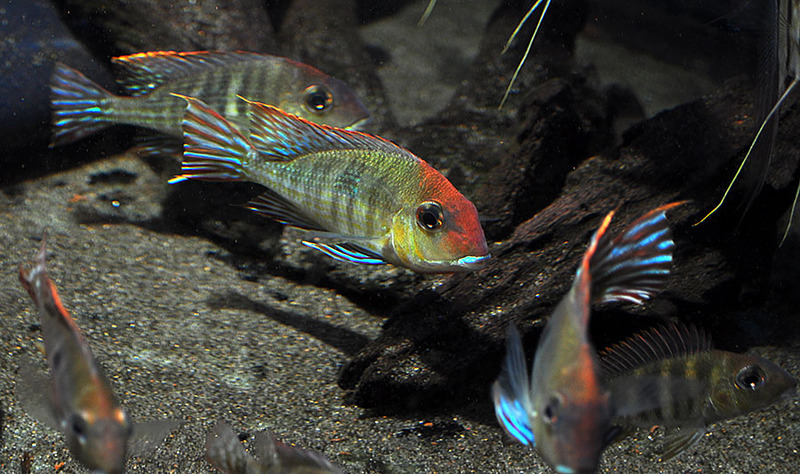 Another group of Altums that lived without Geophagus remained much more timid. Perhaps the gregarious nature of these Geophagus sent a message to the Angels that everything was OK…no need to be on edge. Another look at the pair (female left, male right) – what’s all the commotion about? As the Tapajos grew, I narrowed the group down to eight fish, and that’s what remains today. They currently reside in a 52-gallon corner tank with 10 Atapabo Altums, and are slated to be moved into a 75 or 90-gallon in early September. That said, the Geophagus are obviously happy where they are. I’ve seen three prior spawns, evidenced only by a male and female refusing food and having bulging buccal cavities. Being “delayed” biparental mouthbrooders, I never really knew when they had spawned. That all changed the morning of August 29th. I got into the basement particularly early, and this is what I found. I always love the unexpected—and often inconvenient—discoveries I make, where I have to drop everything, run for the camera, and take a quick burst of photos and hope some turn out before getting back to the actual tasks at hand. It means you don’t always get the best shots, but they’re still worth sharing sometimes! They left the eggs “out” most of the day, and come time for lights out, they were picking them up. I wish the Altum Angelfish had not been in the way! Gene, coming back to look at these photos, I know what that substrate is, and it normally looks nothing like that! Man it just looks dirty…just probably algae growing on the grains of sand but nevertheless, dirty! The actual sand substrate in this tank is CaribSea’s Instant Aquarium Sunset Gold Sand (left photo on the product page at http://www.caribsea.com/caribsea_instant_aquarium.html – that color is pretty accurate to what it looks like in real life). It’s a nice sand, I have it in several aquariums here. I am very interested in what you said to be “doubling the broodstock tank” I am not quite sure I got what it meant, am I wrong to understand that you succesfully bred both angels and geos in the same tank ? should that be feasibly in my case with leopoldis ? Summing it all up, I have two tanks, one 65g and one 33g, some geos and some angels which I would like to breed, assuming that the fry rearing setup won’t include those tanks, how would you recomend me to stock them ? Thankfully temperatures are of no worry here, as I live in the northern part of Brazil, so that’s one less worry. Good evening Gustavo, indeed, you did understand what I was getting at, simply trying to house broodstock of mulitple species in an aquarium to maximize production of fry out of a single tank. You still ultimately have to rear the offspring in their own dedicated grow-out space, but there’s no reason you can’t have both say, a spawning pair of angelfish, and a spawning pair of Geophagus, sharing the same tank. You probably could also have spawning dwarf cichlids, spawning catfishes and plecos. That simply allows less fishroom to be taken up by dedicated species-specific spawning tanks, allowing more space for actual fry rearing. I’ve never kept Leopoldi Angels, so I cannot speak to their needs, but it seems like you’d probably be able to work with both species in the 65 gallon, leaving the 33 open for some other project or need if not being used for fry rearing. Good evening Gustavo, indeed, you did understand what I was getting at, simply trying to house broodstock of mulitple species in an aquarium to maximize production of fry out of a single tank. 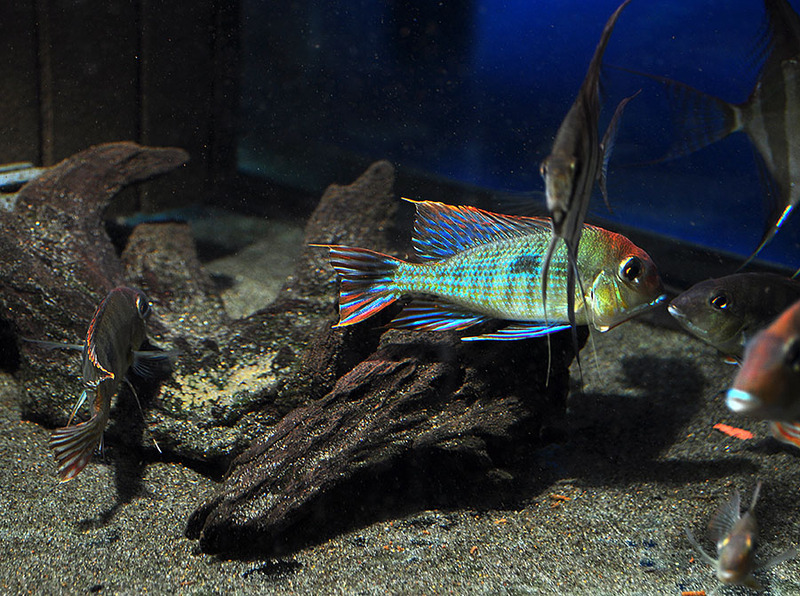 You still ultimately have to rear the offspring in their own dedicated grow-out space, but there's no reason you can't have both say, a spawning pair of angelfish, and a spawning pair of Geophagus, sharing the same tank. You probably could also have spawning dwarf cichlids, spawning catfishes and plecos. That simply allows less fishroom to be taken up by dedicated species-specific spawning tanks, allowing more space for actual fry rearing. I've never kept Leopoldi Angels, so I cannot speak to their needs, but it seems like you'd probably be able to work with both species in the 65 gallon, leaving the 33 open for some other project or need if not being used for fry rearing. Hi there, I have been reading a lot about these guys, currently I have 8 of them at around 2", they are in a 33g grow out, tomorrow or in this following week I might be putting them in a 65g tank with 6 (maybe more... up to 8 I say) Leopoldi angelfish that I am picking up tomorrow, my ultimate plan is to keep 1-2 pairs in the 65g (the others will be moved to my community of 110g), if I keep two pairs, I might very possibly use a tank divider, as I plan to eventually rear their fry; I am very interested in what you said to be "doubling the broodstock tank" I am not quite sure I got what it meant, am I wrong to understand that you succesfully bred both angels and geos in the same tank ? should that be feasibly in my case with leopoldis ? Also, something else, as of now the 33g tank is supposed to be growout for the community tank (can't trust them bichirs with small fish...) but when the geos have a mated pair it should have been out of use for a while, I was planning to rear the fry of the pair(s) in there, but it might be possible to get some large plastic tubs in the backyard, which probably would be more suitable to the fry, could I keep a pair of geos or angels in this tank ? I know I can keep a pair of the classic scalare with no trouble, but leopoldis... I'm not so sure... Summing it all up, I have two tanks, one 65g and one 33g, some geos and some angels which I would like to breed, assuming that the fry rearing setup won't include those tanks, how would you recomend me to stock them ? Thankfully temperatures are of no worry here, as I live in the northern part of Brazil, so that's one less worry. Thanks for all, Gustavo. Gene, coming back to look at these photos, I know what that substrate is, and it normally looks nothing like that! Man it just looks dirty...just probably algae growing on the grains of sand but nevertheless, dirty! The actual sand substrate in this tank is CaribSea's Instant Aquarium Sunset Gold Sand (left photo on the product page at http://www.caribsea.com/caribsea_instant_aquarium.html - that color is pretty accurate to what it looks like in real life). It's a nice sand, I have it in several aquariums here.